“The city that never sleeps is the backdrop for some of literature’s best love stories,” writes librarian Gwen Glazer in the post Finding Love in NYC, Literally on the New York Public Library’s blog. The NYPL’s book experts weighed in with their favorite romantic scenes that take place in the city, across all five boroughs. Some highlights are the Brooklyn Bridge in Saint Mazie by Jami Attenberg, where the main character, an independent young woman, has a passionate moment with her lover—scandalous for the 1920s; the Metropolitan Museum of Art, which is used as a backdrop in Edith Wharton’s The Age of Innocence; and vibrant Union Square in Pete Hamill’s Forever. The NYPL’s own gorgeous Rose Main Reading Room makes the list, too, for a scene Truman Capote’s Breakfast at Tiffany’s. An accompanying red-heart-dotted map marks the locales for bibliophiles who want to explore on Valentine’s Day…or any other time of the year. 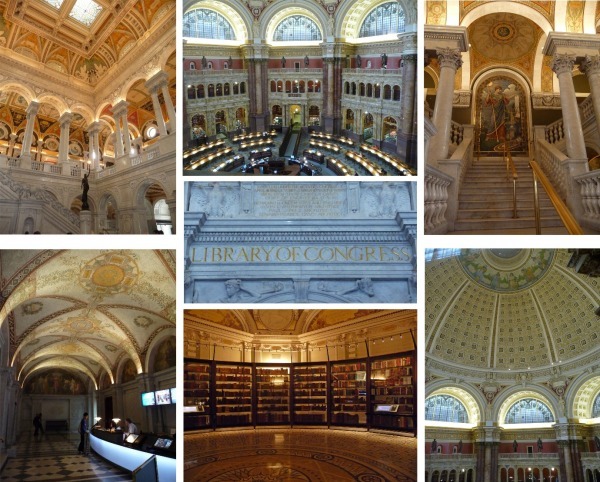 ▫ Some 838 miles of shelves in three buildings on Capitol Hill in Washington, D.C., house the Library of Congress’ bounty of books and other materials. Visitors should head for the Thomas Jefferson Building, where a visual extravaganza awaits. ▫ The Library was initially located in a boarding house after its founding on April 24, 1800, and was later moved to the U.S. Capitol. Its first permanent building—bearing former president Jefferson’s moniker—opened in 1897, making it the oldest federal cultural institution in the country. ▫ Why does Jefferson have the honors? After British troops burned the Capitol building and destroyed the library’s core collection of 3,000 volumes, Congress approved the purchase of Jefferson’s personal library—6,487 books bought for $23,950. The volumes that Jefferson originally contributed are on display (southwest pavilion, second floor). ▫ A bibliophile could move in and be right at home in the dazzling, octagon-shaped Reading Room (photo top row, center). It’s spacious (several stories high); gorgeously decorated with golden-color marble columns, statues of writers, artists, and thinkers like Michelangelo and Shakespeare, and a Renaissance-style dome; and has plenty of reading material. The Reading Room can be viewed from an upper level platform called the Overlook. Standing behind a clear plastic partition takes away some of the grandeur, but it’s still an impressive sight. ▫ Let there be light. The library’s light bulb budget is $100,000 a year. ▫ Bacchus, the Roman god of wine, is one of the images adorning the Thomas Jefferson Building’s main chamber. The Great Hall soars 75 feet, rising from a marble floor to a stained glass ceiling. Take some time to soak up the splendor of the Great Hall. Look up, down, and sideways, or you’ll miss its nuances. 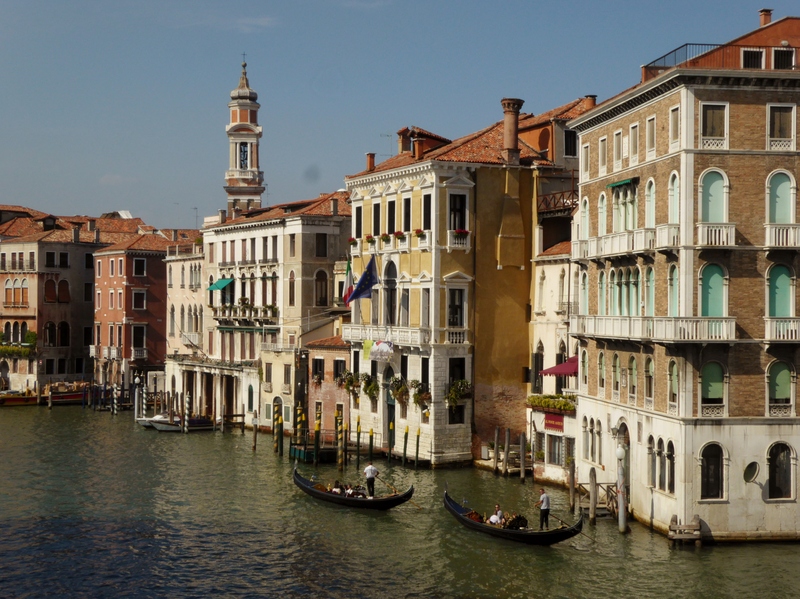 Woven into the eye-catching display of mosaics, statues, paintings, and decorative details—some of it drawing on the Italian Renaissance style—are themes of literature, music, philosophy, education, and architecture, along with references to the zodiac and mythology and tributes to other countries. ▫ The Guttenberg Bible, on display in the Great Hall, is one of a three-volume set. To reduce wear and tear on the fragile documents, it’s changed out periodically—under armed guard. ▫ Size matters. 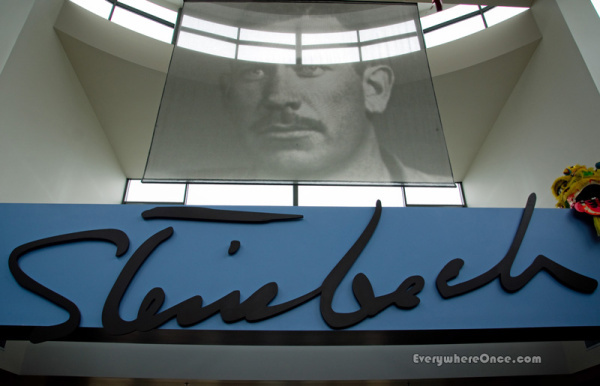 The collection contains nearly 167 million items, making it the largest library in the world. Of those, 39 million are books (including Novel Destinations) and other printed materials. The rest are films, photos, prints, maps, manuscripts, and sheet music. About half of the books and serials are in languages other than English. ▫ Pick and choose. Every day the library receives 15,000 new items, approximately 12,000 of which are added to the collection. ▫ It’s well worth the time to take a free 60-minute, docent-led tour. It gives a fascinating, more in-depth perspective than strolling through the building on your own (I’ve done both). Learn about the library’s creation and collection, as well as its impressive architectural details. Tours are given several times daily Monday through Saturday, and there’s no need to reserve a spot. Even if 50 or 60 people show up, guides break tour-goers into smaller groups. ▫ Only members of Congress and their staff can check out books. The rest of us can view the digital collection online. The classic literary world includes some curious connections between scribes who lived decades, and sometimes centuries, apart. 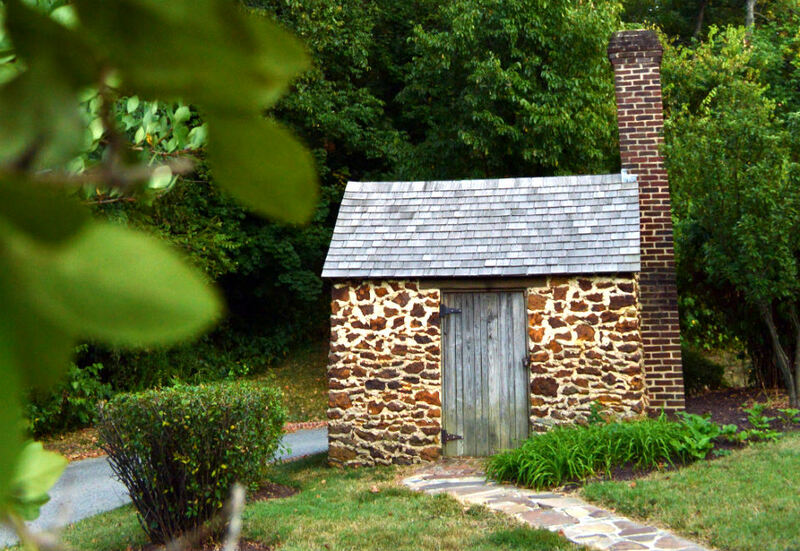 Frederick Douglass’ “growlery,” or writing cabin. Photo: © NPS/Johnson. Walden Pond, Henry David Thoreau’s milieu. Put on your walking shoes and explore these eight literary trails, following in the footsteps of Edna St. Vincent Millay, Jack London, and other writers in the landscapes where they lived, wrote, and found inspiration. The dramatically scenic Yorkshire Moors, where Emily Brontë’s Wuthering Heights unfolds, is one of the most atmospheric places for a literary hike. 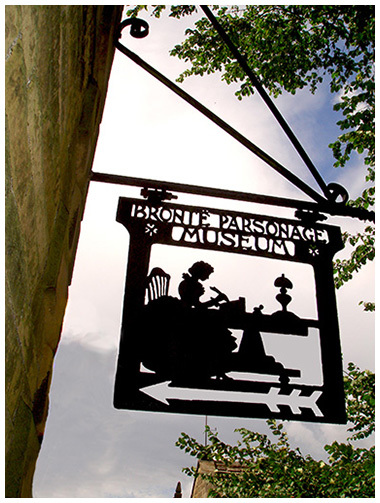 A 2 ½-mile walk from the sisters’ former home, now the Brontë Parsonage Museum, leads across heather-dotted hills to their favorite destination, a gentle waterfall and stream. Venture on a mile farther to see the ruins of an isolated farmhouse, Top Withens, credited as being the setting of Heathcliff’s domain in Wuthering Heights. “I walked on to the cliff path again, the town behind and below waking up now so very slowly,” Dylan Thomas wrote in the radio sketch “Quite Early One Morning.” In the Welsh town of New Quay, where the poet moved in 1944, the Dylan Thomas Trail traces the route along the coastal walkway above town he referenced. Other Thomas-related places in the city center are noted as well, like the restaurant and bar at the Black Lion Hotel—a perfect stop for a post-hike restorative. 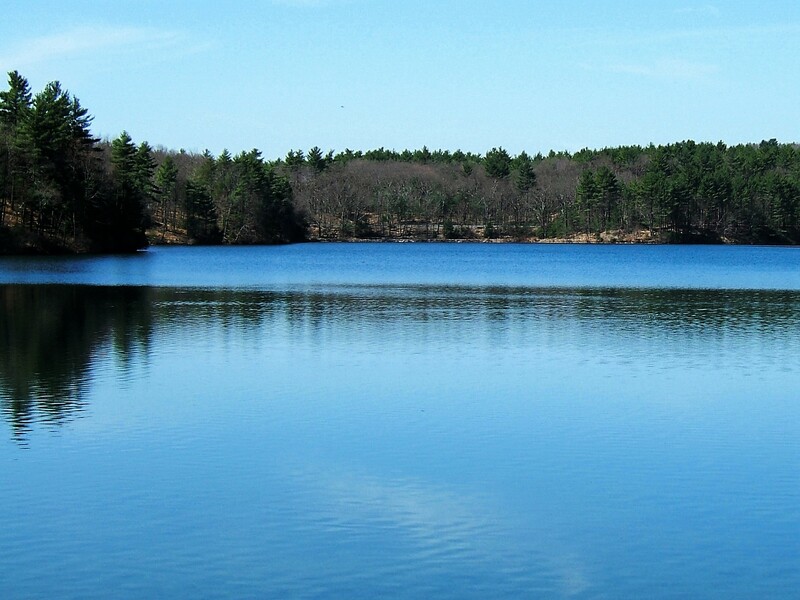 Henry David Thoreau staked out a spot on a secluded piece of land near Walden Pond owned by his friend Ralph Waldo Emerson, living there for two years and turning out his most famous work, Walden. To reach the site where the naturalist’s one-room cabin once stood, take the Pond Path for a gorgeous view of the lake he described as “lying between the earth and the heavens.” Return via the Ridge Path through oak and pine woodlands where Louisa May Alcott and her sisters accompanied family friend Thoreau on nature walks. 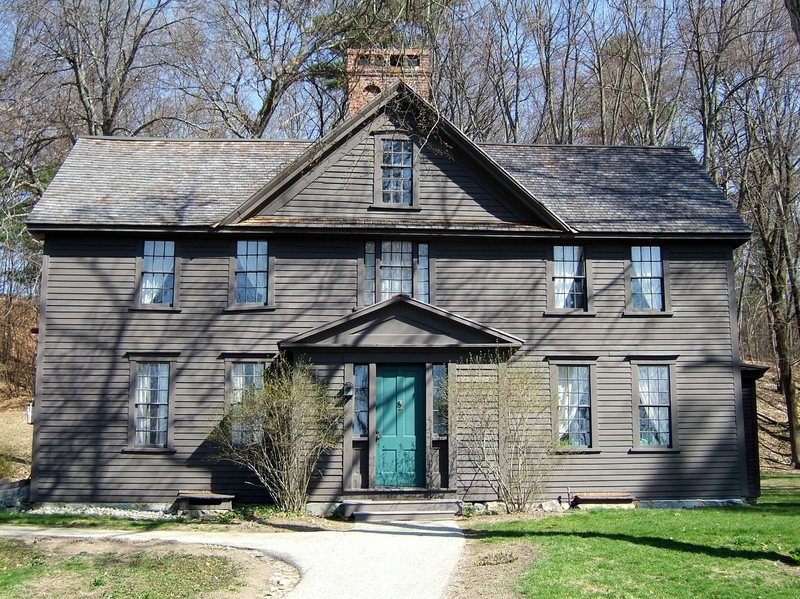 A replica of Thoreau’s abode can be seen near the Walden Pond State Reservation visitor center. The adventure writer’s 1,400-acre Sonoma Valley ranch was situated on the site of a former winery and is now Jack London State Historic Park. The park’s trail network ranges from back country hikes to easily accessible pathways, including the Beauty Ranch Trail, which leads through the heart of London’s property past landmarks such as the cottage where he wrote many of his short stories and novels. Two years after winning the Pulitzer Prize for poetry in 1923 (the first woman to do so), Edna St. Vincent Millay and her husband bought a former blueberry farm they named Steepletop in rural eastern New York State. Along with touring the white clapboard farmhouse and sunken gardens landscaped by Millay, visitors can take a walk to the poet’s grave site along the Millay Poetry Trail, located in a forest dotted with white birch trees and signposted with excerpts from her nature poems. If you have several days and lots of stamina, this 92-mile cross-country walk winds through lowland valleys and sheep farms, over Borderland hills, and past lochs and rivers as it connects sites associated with novelist Sir Walter Scott’s life and work. Noteworthy stops along the way include the Tibbie Shiels Inn, a 19th-century stagecoach stop that has served up drams to Scott, Robert Louis Stevenson and Thomas Carlyle, and Abbotsford, the turreted, castle-like manor house Scott designed and filled with antique furnishings and historic relics like Rob Roy’s sword. While in the Napa Valley, newlyweds Robert Louis Stevenson and his wife, Fanny, ran low on money and left a hotel cottage for Silverado, an abandoned mining town. For two months in 1880 they lived in a ramshackle bunkhouse on the slopes of Mount St. Helena, an adventure Stevenson recounts in the memoir THE SILVERADO SQUATTERS. A 10-mile round trip hike in Robert Louis Stevenson State Park leads to the site where the couples’ cabin once stood. At the summit of the challenging trek, stunning views of the San Francisco Bay Area await. Lord Alfred Tennyson once said the salty sea air on this English Channel isle was “worth sixpence a pint.” Traverse the Tennyson Trail to emulate the poet, who took long morning walks each day on the isle, where he settled in 1853 and spent the last 40 years of his life. The 15-mile trail runs through forests and above chalky white cliffs with sweeping vistas of the Atlantic Ocean and mainland England. 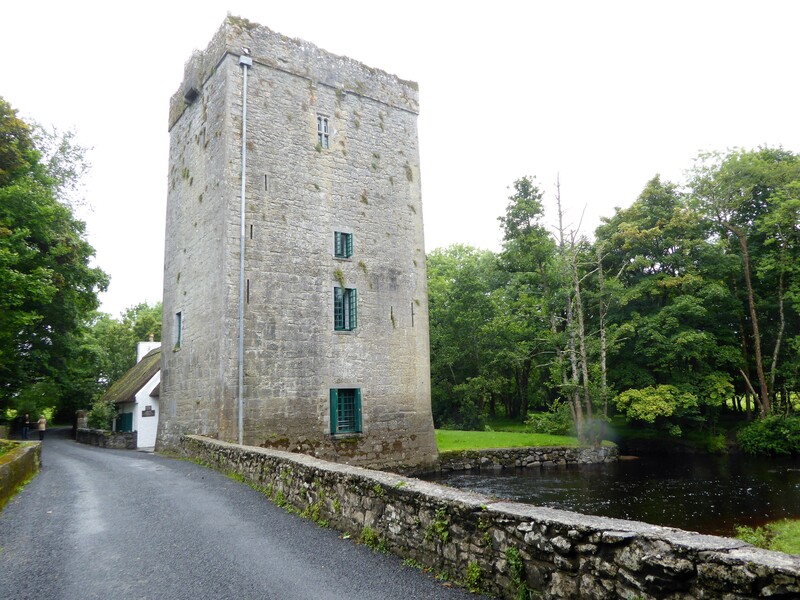 A century ago, in 1917, bard William Butler Yeats purchased a 15th-century Norman tower in the Irish countryside as a summer home. “I shall make it habitable … It is certainly a beautiful place,” he informed his father. For Yeats, Thoor Ballylee was “a place full of history and romance” that inspired some of his later masterful works, including “The Tower” and “The Winding Stair.” While today the abode—which has been prone to winter flooding due to its riverside location—is mostly devoid of decorations or furnishings, there is atmosphere aplenty in the four-story structure with a stone staircase winding through the tower and leading to a roof platform. Thoor Ballylee is located in County Galway and best reached by car. 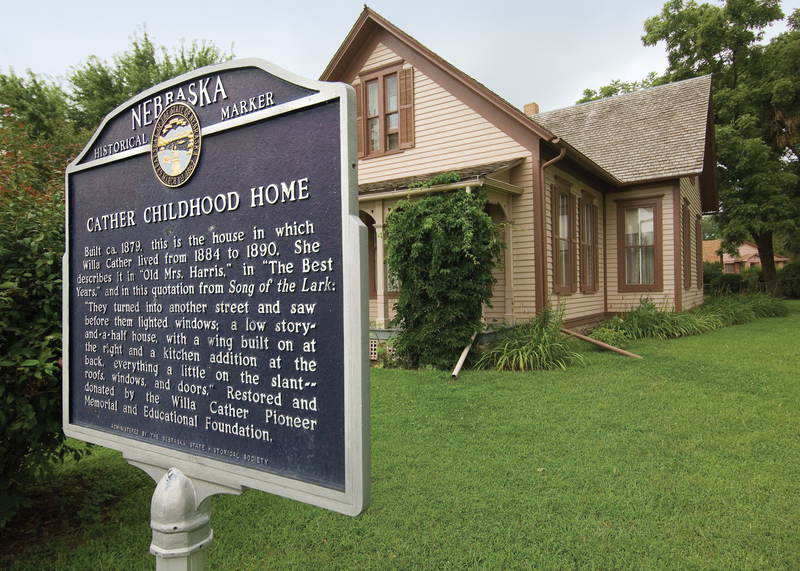 For an off-the-beaten-path location, the tower sees plenty of activity. On the day I visited last summer, a local television station was filming a travel segment, and recent visitors had included the novelist Colum McCann and former U.S. Senator Chris Dodd. In the now-restored dining room, the Yeats family would fish out the window, which opens above the Streamstown River. 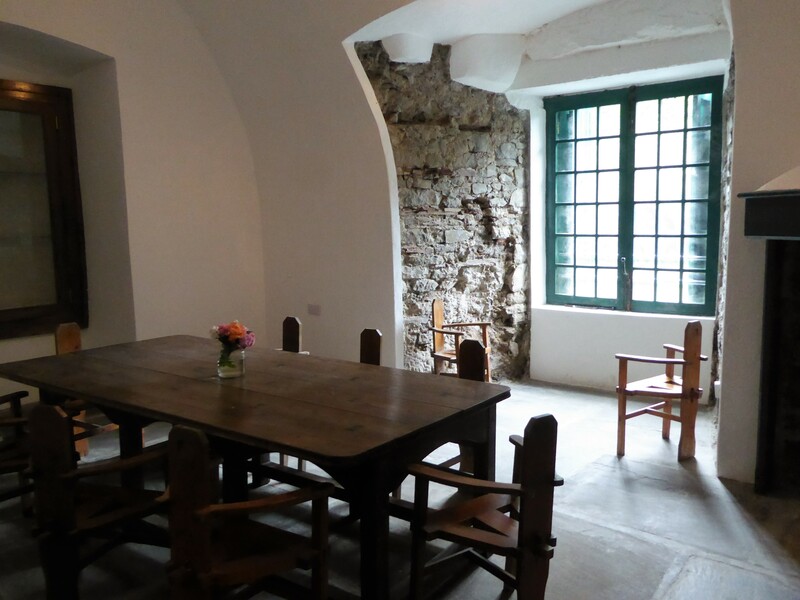 Visitors can explore the tower at their leisure and also peruse some illustrated exhibits that shed light on Yeats’ personal and professional lives. One exhibit is devoted to the women who greatly influenced the wordsmith—like his wife, George Hyde-Lees, who feigned episodes of spirit-guided writing to prompt his poetry, and Maude Gonne, the unrequited love of his life. Thoor Ballylee is open during the summer months and well worth a stop when literary traveling on the Emerald Isle. Watching the drama To Walk Invisible: The Brontë Sisters is likely to cause literary wanderlust. (It airs Sunday, March 26, on PBS-Masterpiece.) The backdrop is the Yorkshire village of Haworth and the surrounding moors, a dramatically scenic landscape that helped inspire the novelist sisters’ page-turners Jane Eyre, Wuthering Heights, and The Tenant of Wildfell Hall. Here are five things for bibliophiles to do in Brontë Country. Ramble on the moors. Venture into Wuthering Heights territory as you follow in the sisters’ footsteps across the wind-swept moorland around Haworth. 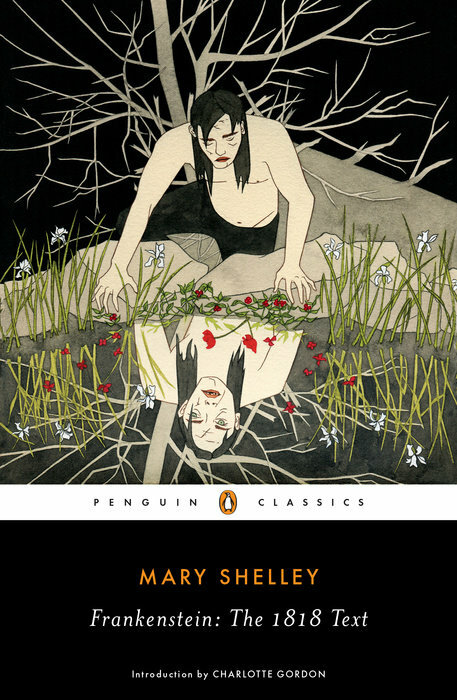 A 2.5-mile walk from town leads to the Brontës’ favorite destination, “the meeting of the waters.” There, Emily would recline on a slab of stone, today dubbed the “Brontë chair,” to play with tadpoles in the water. Continue on another mile to reach the stone ruins of an isolated farm known as Top Withens, credited as being the setting of Heathcliff’s domain in Wuthering Heights. Have a pint at the Black Bull. 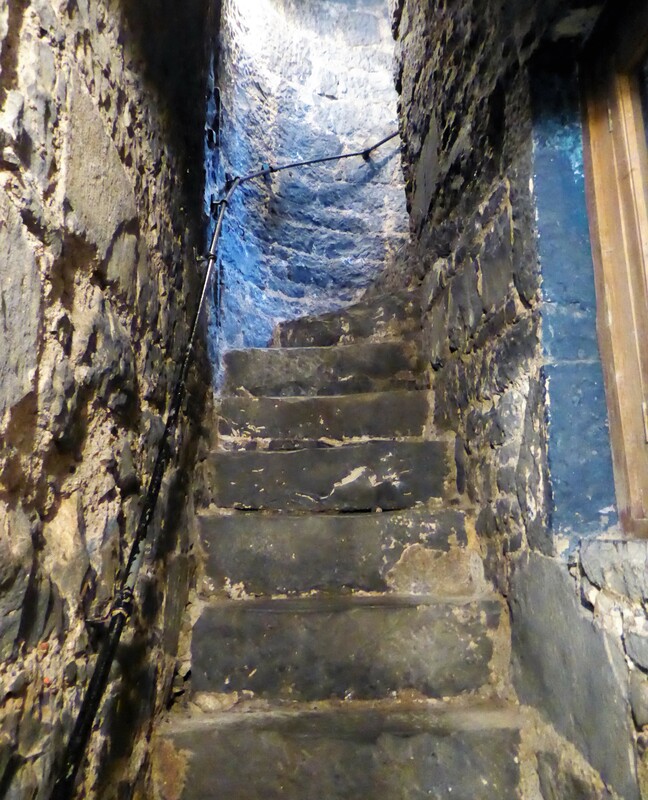 At the top of a steep cobblestone street in the center of Haworth is the cozy, 300-year-old watering hole where wayward Branwell Brontë frequently whiled away the hours. Though a talented painter and poet, he was unable to hold a steady job and increasingly found solace in alcohol and opium. In an alcove up the stairwell, his favorite chair has been given pride of place. Read a book in the Brontë Meadow. Break out the dog-eared copy of your favorite Brontë novel that you toted along and read a passage or two. Adjacent to the museum, the Brontë Meadow has gorgeous views of the countryside and is a perfect introduction to the novelists’ territory, especially if you don’t have time for a lengthy walk on the moors. For more about the Brontë sisters and the landscape that inspired them, check out the expanded and updated edition of NOVEL DESTINATIONS, which has a brand-new, in-depth narrative chapter about Brontë Country. Available May 2nd.